Omg there is cake! Having fun @veganyumm. VEGAN adds to 22 and CAKE adds to 11, so vegan cake has a Master 33 vibration, the same as Wake Up Call. I’ve wanted to blog on why I’m not vegan but love their food (aka the carrot cake vs carrot stick approach), but held back out of fear of offending people. Telling someone how to eat is telling them how to think, a recipe for power struggles. Inspire me with your wellness, not your warfare. The first time I met a vegan group, I asked one guy why he didn’t get help, despite being unwell. He gave me the impression that he’d rather be sick than break his ideals. That chat convinced me that food is a tool for learning and it’s not my place to shortcut someone’s journey. That said, as a past life regression therapist in Brisbane, I have never met someone who was vegan in every lifetime. We chop and change depending on lifestyle. I believe plants are as conscious as animals and it’s about honouring your food rather than calling it good or bad. I say this based on trial and error – I’m an environmental scientist, who studied agriculture, nutrition and fundraised for Greenpeace and animal welfare charities for years. I used to feel so guilty about everything, I gave up red meat, became anaemic and developed Orthorexia (health-obsessive anorexia). Did you know? Many people who see 11:11 go through a clean eating and organic phase as their intuition increases. I was at that stage when I fell pregnant with Forrest. Then, all I wanted was sausages, home grown sprouts and chocolate. Following my gut and meditation gave me courage. It meant I started my parenting journey as my child’s confidante and never doubted that we chose each other. More on Forrest’s birth story and Charlie’s birth soon afterwards. We need more listening and less lecturing when it comes to diets and kids…the answers are within. Whatever you eat, bless it and keep growing. No trolling please. 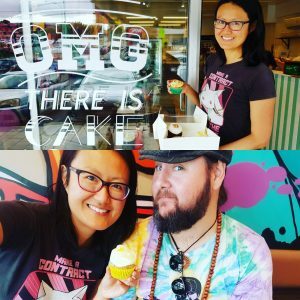 Rainbow Nourishments – Anthea my cousin made our vegan wedding cake! I have never seen the combination of praising vegan cake alongside respecting people’s non-vegan food choices. Yet I believe in both! Awesome post.